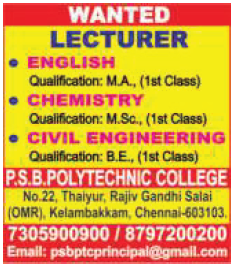 P.S.B.Polytechnic College, Chennai has advertised for recruitment of Teaching Faculty- Lecturers jobs vacancies. Interested and eligible job aspirants are requested to apply immediately from 25th November 2018. Check out further more details below. About College: P.S.B. Trust was established in the year 1996 by our founder Er.S. PETHIAH. The motto of this trust is to impart supreme knowledge and holistic training in the field of Technical Education. It is located in Old Mamallapuram road(OMR) also Called as IT highway. It is the most happening place in chennai for higher education. Our college is just 2 kms from kelambakkam the rapidly growing commercial hub of chennai. It is only 25 kms from airport. Our Institution inculcates education with discipline. How to Apply: The candidates are requested to send their updated resume, copies of certificates (Mark sheets / PAN card / Aadhaar card) and recent PP size photos to the email address or postal address provided below.